I was “unfriended” the other day…actually twice. 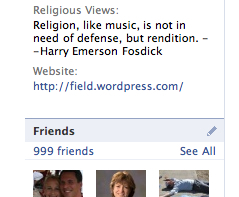 One day my friend count on Facebook was 1001…the next day it was 999! What to do? Now, I’m fully aware of the superficial nature of the friendship counter on my Facebook profile. One’s friend number is entirely reflective of your FB friending criteria. For a long time I held a pretty conservative line on who I would add as a friend on FB…only someone I know very well. Then it moved to , “do I recognize their face?” Now, it depends on my mood. I usually friend anyone I can place somewhere in some iteration of my life. One thing that Facebook has done is provide some very intriguing perspective on this idea of friendship. First of all, I can easily begin to place my 999 friends into very specific categories corresponding to different times of my life: growing up on Bayou Lafourche; going away to LSU; seminary in Fort Worth, TX; returning to Louisiana for my first ministry job; moving to Tennessee. Those can be broken down even more to the individual churches I was a part of, people I met at conferences, friends from other countries met through my travels. A pleasant surprise has been the “friends of friends” that I’ve never met face to face…we’ve only “talked” on Facebook walls and messages. I enjoy immensely conversations that spring up among friends of mine who have never met. It’s interesting how these varied relationships have changed. There are people who I considered very close friends when we lived near each other and talked regularly who I haven’t really spoken to since we became Facebook friends. There other relationships that have deepened due to Facebook conversations…conversations that might never have occurred in person. In several instances, I’m closer now to a few people I’ve never met face to face than I am to people I used to hang out with. One last observation…I realize that Facebook profiles place some of our personality traits and beliefs out front for people to see…things that either don’t come up in casual conversations or that we don’t necessarily want people to know. I’m not talking about sinister-loss-of-privacy-TMI kind of stuff. I now know that a couple of my friends are HUGE Metallica fans…nothing wrong with that at all, just wouldn’t have thought it at first. I know that I have some artists. Some political liberals…some political conservatives. Some theological liberals…some conservative. Some believe in God. Some do not. Gay. Straight. Pro-life. Pro-choice. yada, yada, yada… The diversity is simply amazing. And for me, it’s pretty energizing. I’m realizing that I value the diversity and the conversations more than I do homogeneity. Maybe that’s what I truly love about Facebook. We tend to live pretty compartmentalized lives. The public faces of our offices and churches are pretty mask-like…we don’t want to rock the boat so we hold back important parts of who we are to maintain the social mores. With Facebook, I’m sitting in a large room with a thousand friends from different parts of my life. Occasional conversations pop up. Sometimes I think, “OH #$%, those two are talking politics!! !” or “I miss seeing those people on a regular basis.” or “That’s really cool!” And countless other things…I love my FB Peeps. So I was un-friended…not sure why…could be a lot of reasons. I really don’t mind that much…it’s happened before and will happen again. Who’s going to be my next 1000th friend? Religion has often unintentionally enabled scientific skepticism. The faithful will issue a challenge to science: Ha, you can’t explain the development of life, or the moral sense, or the nearly universal persistence of religion. To which the materialist responds: Can too. It is all biology and chemistry, thus disproving your God hypothesis. To this musty debate, Andrew Newberg, perhaps America’s leading expert on the neurological basis of religion, brings a fresh perspective. His new book, “How God Changes Your Brain,” co-authored with Mark Robert Waldman, summarizes several years of groundbreaking research on the biological basis of religious experience. And it offers plenty to challenge skeptics and believers alike. Newberg argues that religious belief is often personally and socially advantageous, allowing men and women to “imagine a better future.” And he does not contend, as philosophically lazy scientists sometimes do, that a biological propensity toward belief automatically disproves the existence of an object of such belief. “Neuroscience cannot tell you if God does or doesn’t exist,” Newberg states with appropriate humility. Neurobiology helps explain religion; it does not explain it away. But Newberg’s research offers warnings for the religious as well. Contemplating a loving God strengthens portions of our brain — particularly the frontal lobes and the anterior cingulate — where empathy and reason reside. Contemplating a wrathful God empowers the limbic system, which is “filled with aggression and fear.” It is a sobering concept: The God we choose to love changes us into his image, whether he exists or not. Newberg employs a vivid image: two packs of neurological wolves, he says, are found in every brain. One pack is old and powerful, oriented toward survival and anger. The other is composed of pups — the newer parts of the brain, more creative and compassionate — “but they are also neurologically vulnerable and slow when compared to the activity in the emotional parts of the brain.” So all human beings are left with a question: Which pack do we feed? “How God Changes Your Brain” has many revelations — and a few limitations. In a practical, how-to tone, it predicts “an epiphany that can improve the inner quality of your life. For most Americans, that is what spirituality is about.” But if this is what spirituality is all about, it isn’t about very much. Mature faith sometimes involves self-sacrifice, not self-actualization; anguish, not comfort. If the primary goal of religion is escape or contentment, there are other, even more practical methods to consider. “I didn’t go to religion to make me happy,” said C.S. Lewis, “I always knew a bottle of port would do that.” The same could be said of psychedelic drugs, which can mimic spiritual ecstasy. Yet, he told me, “To this day, I am still seeking and searching.” And that is the most honest kind of science.